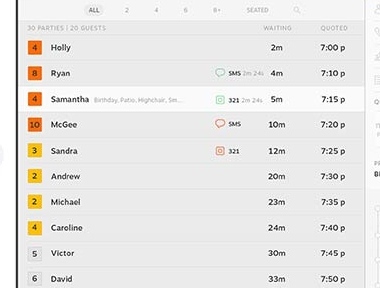 Colored status indicators help your host manage quoted times and easily prioritize guest seating. Once the estimated time or quoted time has been exceeded for a guest, the status indicator turns red. A host can also be alerted when a quoted wait time is approaching by turning on the warning indicator in the settings menu. The warning indicator turns yellow and can be set in minute increments. Waiting - The status indicator icon is gray, when the guest is first added. Warning - The status indicator turns yellow when the wait time is almost up. It is a warning to your host that a guest’s quoted wait time is approaching and they need to be notified soon. Defining the warning time is up to you. Depending on your restaurant, you may give your host 5 minutes, 10 minutes, or more. You can adjust this number at the top of the Guest List Settings page. The threshold times are available in one minute increments and go all the way up to 30 minutes. The default upon downloading the app is set at zero or off. Estimate Exceeded - The color turns red when the estimated wait time is exceeded and your guest needs to be taken care of immediately.